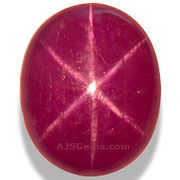 Star rubies are about the rarest of the star gems. You will often see star sapphires in retail jewelry stores, but star rubies are so scarce that they are usually available only from specialized gem dealers. Since ruby and sapphire are both varieties of the mineral corundum, they have the same chemical composition (aluminum oxide) and form stars under similar conditions. The essential element in a star gemstone is inclusions of the mineral rutile (titanium dioxide). If rutile inclusions are densely packed, and aligned in a certain way, then they will reflect light in a multi-ray pattern forming a star. 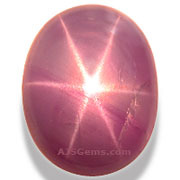 The gem must be cut as a cabochon in order to display a star, and it must have the right proportions -- neither too heavy on the bottom nor too flat on the top. 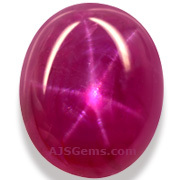 Star rubies are graded by translucency, body color and distinctness of the star. 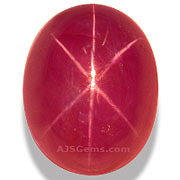 Since the rutile inclusions tend to produce a milky body color, you will rarely see a star ruby with a deep saturated red similar to a faceted ruby. The rutile inclusions also affect the transparency of the gem, so star rubies are usually opaque to translucent rather than transparent. In general there is a tradeoff between the distinctness of the star and the saturation of the body color. More rutile in the stone means a more pronounced star, but a somewhat cloudier color. Since both the star and the body color are important, gem dealers try to strike a balance between the star and the body color in selecting their material. Star rubies may be found wherever rubies are mined. The most famous star rubies are from Burma, source of the finest faceted rubies. The best specimens are translucent with a crimson body color. 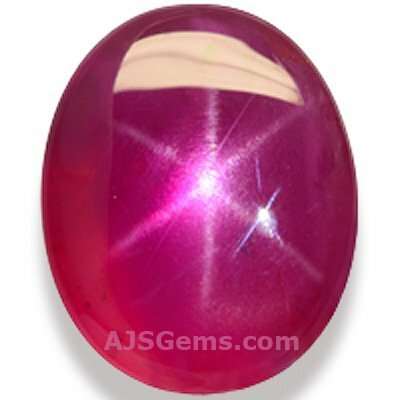 Star rubies have also been found in Sri Lanka and in Africa, particularly Mozambique. Vietnam, though not a major source for ruby, has recently produced some very attractive star rubies. New buyers of star gemstones often have unrealistic expectations of the distinctness of the star. They have seen photographs of these stones that show a sharp and clearly defined star, and perhaps they have also seen synthetic star gemstones with very sharp stars that display perfectly under any kind of light. But this is not the standard by which natural star gems should be judged. To fully appreciate the marvel of a natural star gemstone, the stone should be viewed under a focused light, such as a penlight. The most famous star rubies are the 100.32 ct Delong Star Ruby from Burma, currently in the collection of the American Museum of Natural History; and the 138.7 ct Rosser Reeves Ruby from Sri Lanka, in the Smithsonian Institution.